High Oaks Dental Practice promote Minimally Invasive Dentistry in St Albans. This means using the least destructive option in removing tooth tissue (that is enamel or dentine) to achieve the desired result. Enamel and dentine are precious in retaining teeth for years and although our fillings and crowns are long lasting they are no substitute for the real thing! Therefore our St Albans dentists have trained in the technology to preserve teeth whilst cosmetically enhancing. 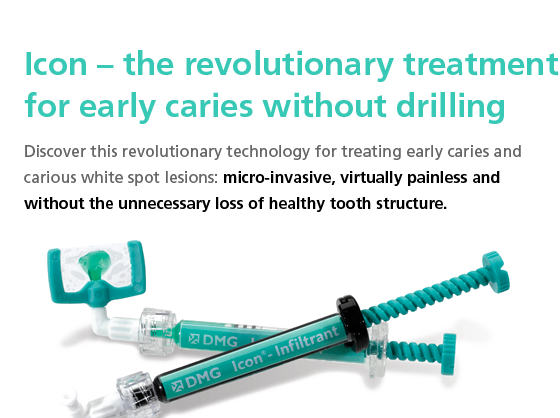 Our St Albans dental practice use ICON treatments to chemically disguise ‘white spots’ on teeth without the need for a drill or anaesthetics. This completely painless treatment occurs over 20-30 minutes after which the tooth is transformed and close to flawless. These are before and after photos of patient who have undergone ICON treatments. This long lasting treatment is the recommended alternative to veneers and crowns. These treatments require no tooth removal and therefore does not damage your teeth or cause any sensitivity.